Loading Review 2019: Is Loading a Good Hosting? Loading.es caters to the hosting needs of the Hispanic community worldwide. They offer feature-rich dedicated hosting packages and shared hosting plans in addition to domain registration, all backed by 30-days warranty. With data centers in Orihuela (Alicante), Loading.es serves more than 33,000+ customers worldwide. The company offers a range of shared web hosting and VPS hosting along with domain registration services and reseller hosting solutions. With 99.9% uptime, Loading.es hosting services are powered by high-grade servers from notable brands, such as Dell, Supermicro, and Dell with SSDs. On-site support technicians monitor their servers day and night for any anomaly. So the chance of downtime and resulting service disruption because of hardware failure is minimal. Underlying the servers are redundancy networks with multiple connectivity via the BGP protocol. You will enjoy excellent server response 365 days a year. Hosting plans come with free app installer loaded with over 100 free applications. With three simple clicks, you can create a website using a CMS or app of your choice. All annual plans include a free domain for 1 year. Popular scripting languages, such as PHP, Perl, and Python are also supported. Not many hosting services facilitate free website and email migration. Load.es takes care of all your migrations including those that are complex to your new hosting account flawlessly. From your website files to databases, they will upload and configure everything to run smoothly on their servers. Simply fill the migration request form on their website or contact the technical support team. With Loading.es, you will never worry about losing data files following an upgrade. Daily backups – across all hosting packages – ensure that you retain copies of key files. With few clicks, you can rollback any undesirable change without disrupting service delivery. Six pricing plans are available with incremental features. The introductory plan, Mini, comes with 1 domain, 1 GB storage space, 20 email accounts, and a free SSL certificate in addition to pre-installed popular apps, such as WordPress, Magento, and MediaWiki. Basic plan comes with all the standard features of the Mini in addition to 3 GB storage space, 100 email accounts, and 1 MySQL database. With the Argentum plan, you get 6 GB SSD disk space that can host 5 domains, 200 email accounts, 5 MySQL databases, and free SSL. Aurum plan comes with 15 GB SSD space and 10 configurable domains. You also get 10 MySQL databases, 30 subdomains, and unlimited email accounts in addition to 10 advanced mail account databases all secure by SSL. If you want more SSD space and many email accounts, you can choose the Titanium plan or the Platinum plan. You will get free SSL, dedicated IP, unlimited subdomains, and many more features. Apart from shared hosting, they also offer ASP hosting under Windows Server 2008. This hosting service supports scripting languages, such as ASP, ASP.NET as well as databases, such as Access and MS SQL. Managed VPS with Remote Desktop and SSH access and upto 100 Mbps bandwidth is the other option on the table. With this, you get enough hardware resources to support all your mission critical projects. Set up is fairly simple with both shared and VPS. Your hosting account becomes active immediately you pay for your plan. Server performance, even with the basic plan, is impressive. With Loading.es, you also enjoy incremental backup on your hosting plan. You can upgrade or switch plans easily. Customers come first, that is the mantra by which the customer care team at Loading.es operates. With a selfless support team that offers personalized attention in Spanish, the company provides timely technical and commercial support at all levels. You can contact them by phone, email, Skype, ticketing system, or the online form. Live operators are available from 8.00am to 8.00pm, Monday to Friday. The average response time is about 30 minutes. Although Loading.es offers some really good packages, it doesn’t match that with great usability. The site isn’t just outdated but is also non-responsive. Navigating wasn’t the problem, but comparing plans was. I looked at the cPanel too and felt it could have been much better. I hope they can reword the design, trim their tables, and offer multiple versions of the site including English. 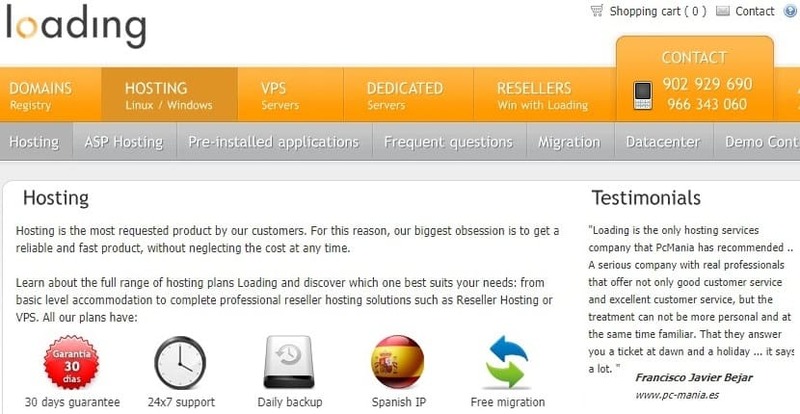 If you’re looking for a reputable hosting company that provides shared and VPS solutions with genuine Spanish IPs, Loading.es is a great option. Wondering how Loading stacks up against other Web Hosting companies? Enter any other Web Hosting company and we will give you a side-by-side comparison.